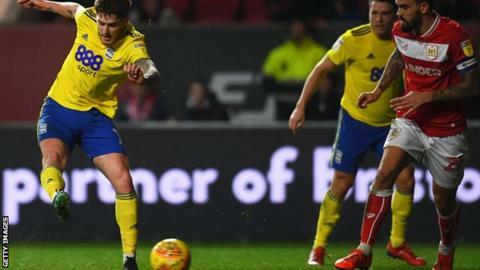 Connor Mahoney scored one goal and created the other as Birmingham City beat Bristol City to move to within three points of the Robins in the Championship play-off places. Both sides had early chances, with Andreas Weimann denied by Blues goalkeeper Lee Camp before Kerim Mrabti tested Niki Maenpaa and Che Adams then crashed an effort off the underside of the bar at the other end. On-loan Bournemouth winger Mahoney put the visitors ahead just before the break with only the second goal of his career on his 50th league appearance. After his heavily deflected shot wrong-footed Maenpaa, he then turned provider in the second half when his free-kick was headed home by Michael Morrison. Famara Diedhiou pulled a goal back with a tap-in to set up a dramatic climax at Ashton Gate but, despite relentless late pressure, Bristol City lost at home for the first time in eight league matches. Birmingham, who have had a hearing over their breach of spending rules delayed until mid-March as speculation about a potential points penalty persists, move up to eighth in the table with their 12th league win of the season. Robins boss Lee Johnson had to watch from the stand, where he served a one-match touchline ban, as the hosts slumped to their third straight defeat in all competitions. Weimann carved out the first real chance, meeting a ball from Adam Webster before forcing Camp to turn his effort around the post. Moments later Maenpaa was called into action, reacting well to keep Mrabti out, but the keeper could only look on soon after as the bar was all that denied in-form striker Adams his 11th goal in nine Championship games. Diedhiou then wasted a glorious a chance for the hosts, and it was one that Blues punished with Mahoney squeezing home the opener before the break and Morrison doubling the advantage just two minutes into the second half. The backtracking Tomas Kalas ensured Blues did not make it 3-0 just after the hour, clearing the danger as Adams looked to roll the ball into an empty net after rounding the keeper. And while a poked finish from Diedhiou gave the hosts renewed impetus, it was not enough as the Robins suffered their second defeat in four days after their seven-game winning league run was ended by leaders Norwich on Saturday. "It's very frustrating. Credit to Birmingham. They've done a job on us. They dominated the game without the ball. "First half, we played into their hands. We weren't compact enough in possession which left us loose and open to the counter. "I tried to adjust that from afar but it was difficult and this is where the players need to recognise that." "This whole season has been about having a small, tight squad. Everyone needs to be ready and has contributed but, at this stage, freshness is needed. "There's a lot of minutes in those players' legs and the bumps and bruises are a little bit more so everyone needs to be ready and the lads showed that. "The key point is the lads are together. Everyone is willing each other on. It doesn't matter who plays, everybody supports each other." Attempt missed. Josh Brownhill (Bristol City) right footed shot from outside the box is close, but misses to the left. Assisted by Tomas Kalas with a headed pass. Attempt missed. Eros Pisano (Bristol City) right footed shot from outside the box misses to the right. Goal! Bristol City 1, Birmingham City 2. Famara Diedhiou (Bristol City) left footed shot from very close range to the bottom left corner. Assisted by Matty Taylor with a headed pass. Attempt saved. Matty Taylor (Bristol City) right footed shot from the centre of the box is saved in the centre of the goal. Assisted by Adam Webster with a headed pass.